Social transformations constitute and are constituted by discourse. The discursive construction of the narrative of European integration is an essential part of public policy making as well as shaping socially shared knowledge and attitudes in Ukraine. At the same time, European integration as a discursive construct is subject to modification in the course of time and /or in different settings of institutional communication. 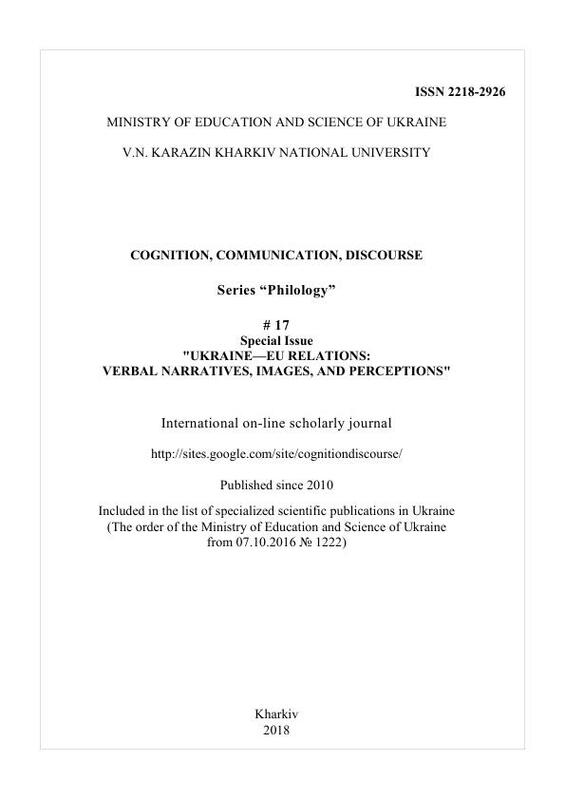 The objective of this article is twofold: to reveal how consistently the narrative of European integration has been constructed in discursive practices of the Verkhovna Rada of Ukraine (the Ukrainian Parliament) in the 21st century and to contribute to the elaboration of a corpus-based methodology suitable for analyzing discourses of social change over time in the Ukrainian language. A combination of quantitative and qualitative approaches is employed to treat the data coming from an ad hoc built electronic corpus of written texts posted on the official website of the Verkhovna Rada between 2002 and 2017. The findings include patterns of naming and reference to European integration as well as the distribution and dynamics of their usage within the observed period. The uncovered modifications in the discursive construction of European integration are interpreted with respect to a wider socio-political context. Since this research is ongoing, avenues of further work on this subject are outlined. Anthony, L. (2018). Visualisation in discourse studies. In Ch. Taylor and A. Marci (eds. ), Corpus Approaches to Discourse: A Critical Review. Oxon/New York: Routledge, 197-224. Baker, P. (2006). Using corpora in discourse analysis. London; New York: Continuum. Börzel, T.A., & Risse, T. (2000). When Europe Hits Home: Europeanization and Domestic Change', European Integration online Papers, 4 (15), http://eiop.or.at/eiop/texte/2000- 015a.htm. Dijk, T van. (2002). Political discourse and political cognition. In P. Chilton & Ch. Schäffner (eds.). Politics as Text and Talk: analytic approaches to political discourse. Amsterdam / Philadelphia: John Benjamins, 203-237. Fairclough, N. (2009). A dialectical-relational approach to critical discourse analysis in social research. In R. Wodak, & M. Meyer (eds. ), Methods for Critical Discourse Analysis. 2nd revised edition. London: Sage, 162-186. Gee, J.P. (2011). An introduction to discourse analysis: theory and method. 3rd edition. New York, London: Routledge. Germond, B., McEnery, T., & Marchi, A. (2016). The EU’s comprehensive approach as the dominant discourse: a corpus-linguistics analysis of the EU’s counter-piracy narrative. European Foreign Affairs Review, 21 (1), 135-153. Gilbert, M. (1989). On social facts. London and New York: Routledge. Haarman, L., Morley, J., & Partington, A. (2002). Habeas corpus: methodological reflections on the creation and use of a specialized corpus. In: C. Gagliardi (ed. ), Quantity and Quality in English Linguistic Research: Some Issues. Pescara: Libreria dell’Università Editrice, 55-119. Kövecses, Z. (2010). Metaphor: a practical introduction. (2nd edition). NY: Oxford University Press. McEnery, T., & Hardie, A. (2012). Corpus linguistics: method, theory and practice. Cambridge: Cambridge University Press. Partington, A., Duguid, A., & Taylor, C. (2013). Patterns and meanings in discourse: theory and practice in corpus-assisted discourse studies (CADS). Amsterdam: John Benjamins. Reisigl, M., & Wodak, R. (2009). The discourse-historical approach (DHA). In R. Wodak, & M. Meyer (eds. ), Methods for Critical Discourse Analysis. 2nd revised edition. London: Sage, 87-121. Sinclair, J.M. (1991). Corpus, Concordance, Collocation, Oxford: Oxford University Press. Stubbs, M. (1995). Collocations and Semantic Profiles. Functions of Language, 2 (1), 23-55. Stubbs, M. (2002). Words and Phrases: Corpus Studies of Lexical Semantics. Oxford/Malden: Blackwell Publishing. Taylor, Ch. (2018). Similarity. In Ch. Taylor and A. Marci (Eds. ), Corpus Approaches to Discourse: A Critical Review. Oxon/New York: Routledge, 19-37. Tollefsen, D. (2002). Organizations as true believers. Journal of Social Philosophy, 33, 395-410. doi:10.1111/0047-2786.00149. Wodak, R. (2009). The discourse of politics in action. Basingstoke: Palgrave Macmillan. Wolczuk, K. (2009). Implementation without coordination: the impact of EU conditionality on Ukraine under the European Neighbourhood Policy. Europe-Asia Studies, 61(2), 187-211. doi:10.1080/09668130802630839. Yavorska, H., & Bohomolov, O. (2010). Nepevnyi obyekt bazhannya: Yevropa v ukrayins'komu politychnomu dyskursi [An Uncertain Object of Desire: Europe in Ukrainian Political Discourse]. Kyiv: Dmytro Burago Publ. and A. Krymskyi Institute of Oriental Studies of the National Academy of Sciences of Ukraine (in Ukrainian).